We Have been told to Delete our Facebook accounts. 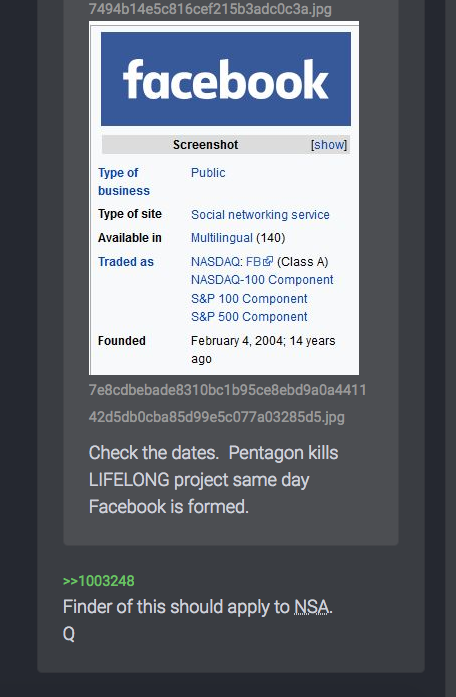 Appears to be the creation from the Cl A's LifeLog Killed the day FB launched. Should you Delete? The following is an article from Wired. 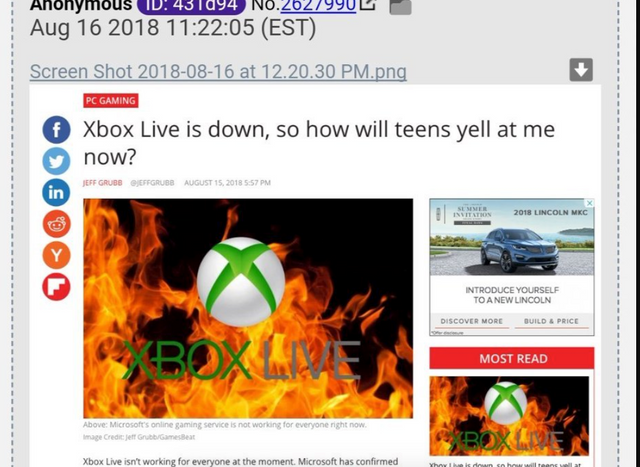 You can read on their site and link is given below in sources. Beware they log how many times you read, so at some point if you have read their quota of free articles, you are asked to subscribe. If you hit this payload wall, you can always clear your cookies. Just know you must remember all passwords from other sites as it generally clears all website tracked info just on your device. You may read the full article below and I will provide the link in Sources. 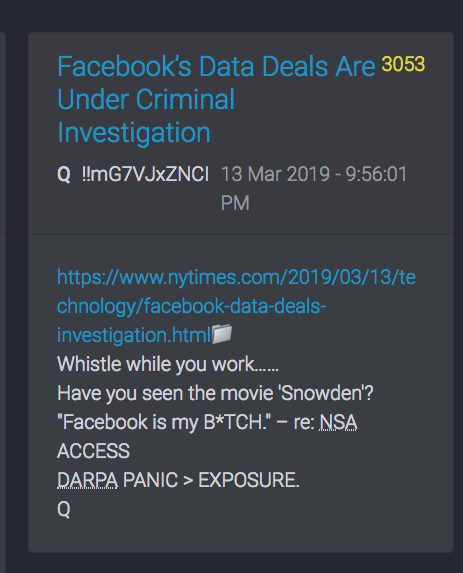 Also given is yet another person's take which supports my believe that. . .if the side of truth leaves, then will facebook just be an echo chamber for the voices of radicals and progressives who don't realize the Democrat representatives are for the globalists rather than citizens? Finally if you are one who wishes to go, Where can you go? Some suggestions will be provided. 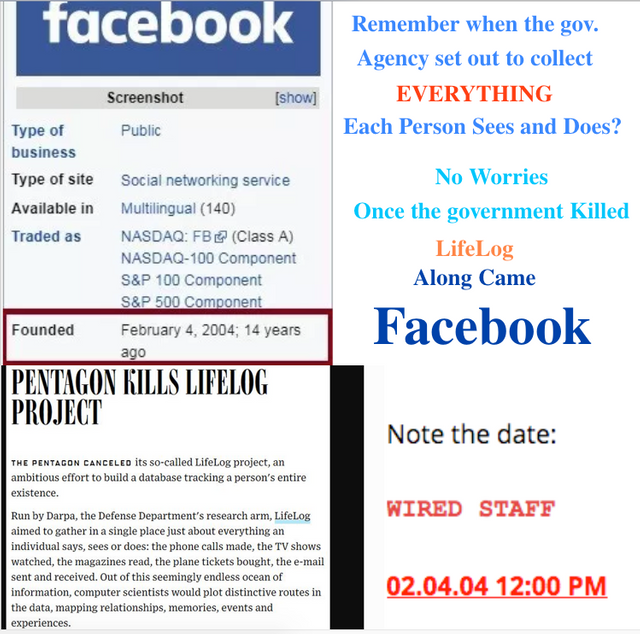 THE PENTAGON CANCELED its so-called LifeLog project, an ambitious effort to build a database tracking a person's entire existence. Should you Delete Facebook? Here is some information so you can make a more informed decision and some thoughts to consider on what FB could become if it is only a Radical Echo Chamber with No One being the Voice of Truth. 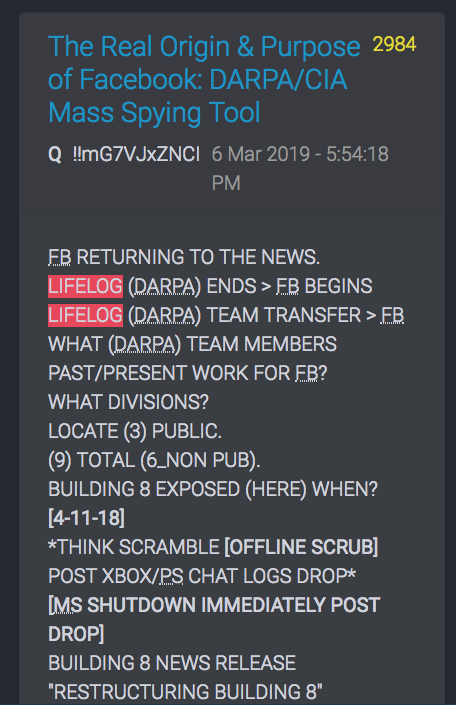 Run by Darpa, the Defense Department's research arm, LifeLog aimed to gather in a single place just about everything an individual says, sees or does: the phone calls made, the TV shows watched, the magazines read, the plane tickets bought, the e-mail sent and received. Out of this seemingly endless ocean of information, computer scientists would plot distinctive routes in the data, mapping relationships, memories, events and experiences. LifeLog's backers said the all-encompassing diary could have turned into a near-perfect digital memory, giving its users computerized assistants with an almost flawless recall of what they had done in the past. 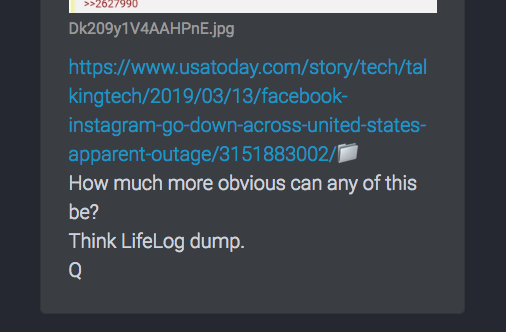 But civil libertarians immediately pounced on the project when it debuted last spring, arguing that LifeLog could become the ultimate tool for profiling potential enemies of the state. Researchers close to the project say they're not sure why it was dropped late last month. Darpa hasn't provided an explanation for LifeLog's quiet cancellation. "A change in priorities" is the only rationale agency spokeswoman Jan Walker gave to Wired News. However, related Darpa efforts concerning software secretaries and mechanical brains are still moving ahead as planned. 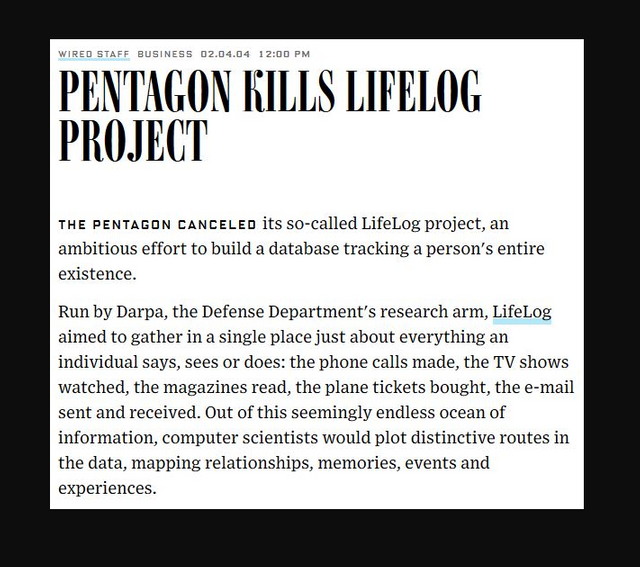 LifeLog is the latest in a series of controversial programs that have been canceled by Darpa in recent months. The Terrorism Information Awareness, or TIA, data-mining initiative was eliminated by Congress – although many analysts believe its research continues on the classified side of the Pentagon's ledger. The Policy Analysis Market (or FutureMap), which provided a stock market of sorts for people to bet on terror strikes, was almost immediately withdrawn after its details came to light in July. "I've always thought (LifeLog) would be the third program (after TIA and FutureMap) that could raise eyebrows if they didn't make it clear how privacy concerns would be met," said Peter Harsha, director of government affairs for the Computing Research Association. "Darpa's pretty gun-shy now," added Lee Tien, with the Electronic Frontier Foundation, which has been critical of many agency efforts. "After TIA, they discovered they weren't ready to deal with the firestorm of criticism." That's too bad, artificial-intelligence researchers say. LifeLog would have addressed one of the key issues in developing computers that can think: how to take the unstructured mess of life, and recall it as discreet episodes – a trip to Washington, a sushi dinner, construction of a house. "Obviously we're quite disappointed," said Howard Shrobe, who led a team from the Massachusetts Institute of Technology Artificial Intelligence Laboratory which spent weeks preparing a bid for a LifeLog contract. "We were very interested in the research focus of the program ... how to help a person capture and organize his or her experience. This is a theme with great importance to both AI and cognitive science." To Tien, the project's cancellation means "it's just not tenable for Darpa to say anymore, 'We're just doing the technology, we have no responsibility for how it's used.'" Private-sector research in this area is proceeding. At Microsoft, for example, minicomputer pioneer Gordon Bell's program, MyLifeBits, continues to develop ways to sort and store memories. David Karger, Shrobe's colleague at MIT, thinks such efforts will still go on at Darpa, too. "I am sure that such research will continue to be funded under some other title," wrote Karger in an e-mail. "I can't imagine Darpa 'dropping out' of such a key research area." Pentagon Wants to Make a New PAL. Who do you Suppose that New Pal was? 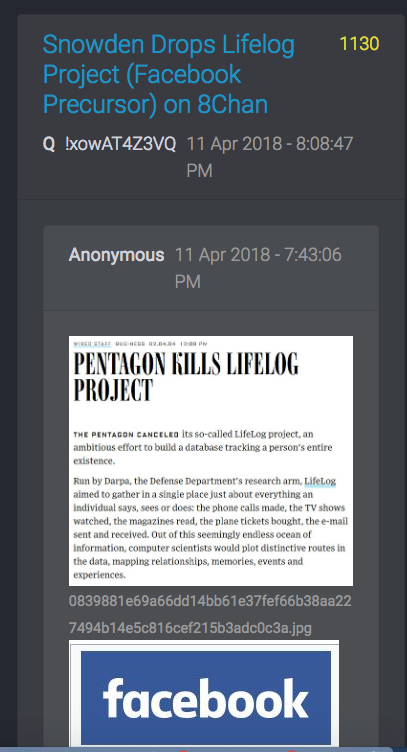 So this is acknowledgement that the CI A created LifeLog, initially set up to log data, was done by DARPA is rather telling. 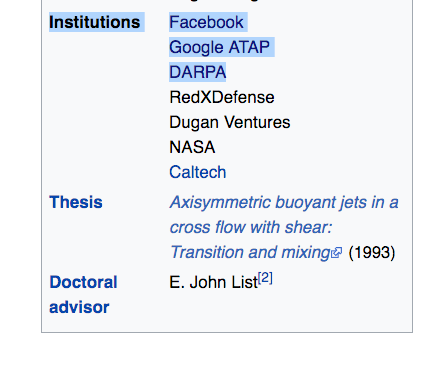 Then the verified link between former DARPA director who also worked for Facebook, is yet another important connection. Regina Dugan continued. . . Currently, Building 8 has four projects underway, and they touch upon cameras and augmented reality, devices that fly, and even brain-scanning technology. According to Business Insider, the technical lead for each project functions as a mini-CEO for the team, which has two years to produce a proof of concept. A Facebook that can read your mind has been on Mark Zuckerberg’s mind for a while now, and Building 8’s team includes a neuroscientist, formerly of Johns Hopkins, who was part of the team that developed a mind-controlled prosthetic arm. This scientist now leads the brain scanning tech project for Building 8! Introducing both virtual and augmented reality into the Facebook world has also been an interest of Zuckerberg’s, and another current Building 8 project involves cameras and augmented reality. A third project with medical applications is being led by a Stanford interventional cardiologist with expertise in the development of early stage medical devices. These academic collaborations are also a part of the Facebook long game, which culminated with the launch of SARA, the “Sponsored Academic Research Agreement,” in December 2016. Well that sounds like fun doesn't it? Or does it? Should More People be asking questions, rather than just freely engaging in this tech with No Questions asked? Here is where some of this is headed. Just the title here is pretty telling without any further clarification from me. It's Rather Glaring for those who have Eyes to see! Philosophers and physicists say we might be living in a computer simulation, but how can we tell? And does it matter? So should you Delete? Haven't they already gathered your info? Are they not already able to predict with accuracy what decision you might make in many situations based on all info gathered across social media platforms, your search habits, interactions with friends, family, opposition? If you go away and you are the voice on the side of Good, the voice of reason, will you just be giving them Precisely what the radical, progressive censors have been trying to weed out already? 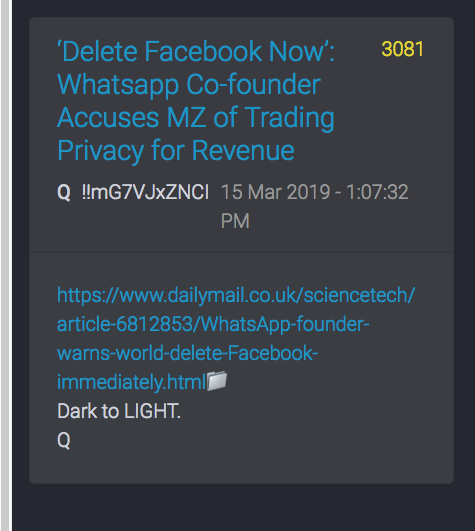 Will Facebook just become another radical echo chamber giving the drum beat of the globalist completely unchallenged? Only you can decide on what you are Called to do! No one else can make that decision for you. Make no mistake, this is a Fight between Good and evil. Are you willing to sit on the sidelines or engage? See more in Sources below. 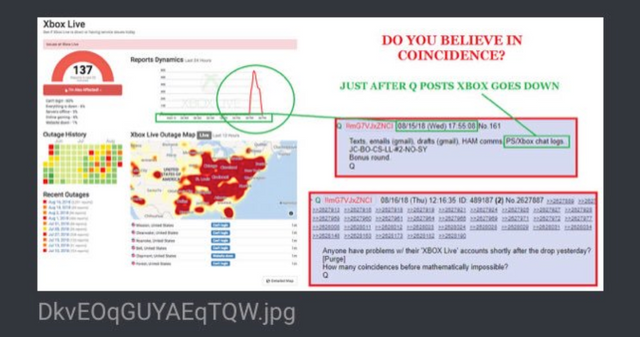 Dear @artistiquejewels, while I have little doubt that Facebook, Google, and countless other online platforms and APPs are creations of the MIC (Military-Industrial-Complex), I strongly advise you to not be duped by Q postings, and Q "itself"
I have stated for almost a year now that there is little doubt that Q is a huge PSY-OP (by these same players in the MIC/CIA/Deep State, the Elite or whatever you want to call them) and I have provided evidence to corroborate this more than once. 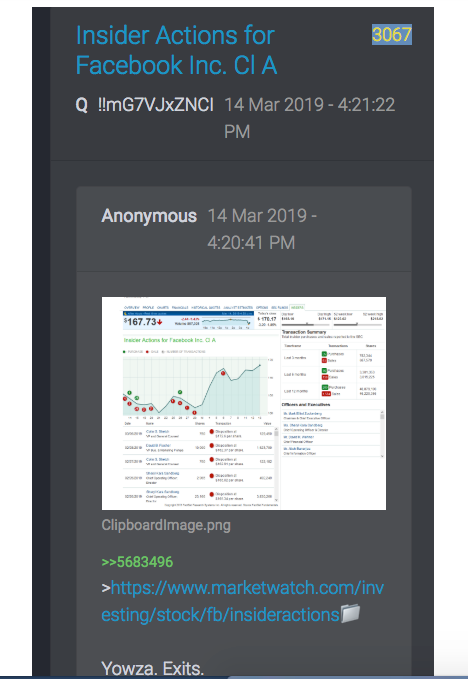 Although, one (i.e., anyone who "follows" Q) may think that the "quality" and "inside" information provided by this outlet is of believable and often shocking/revealing nature, this is exactly their intent and the intent of this Q PSY-OP. 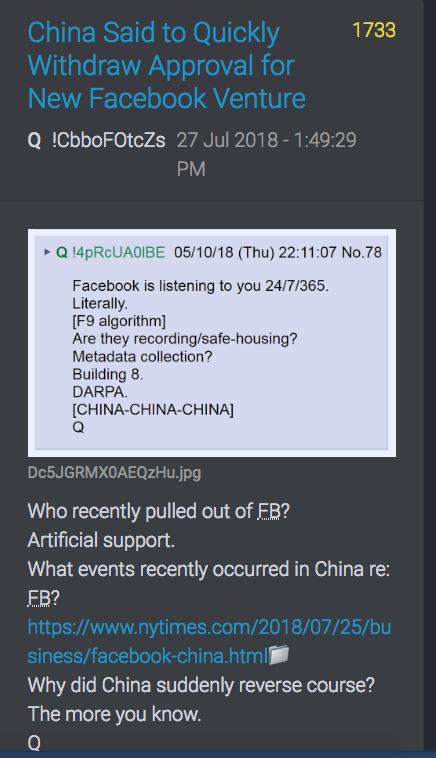 What specifically is coming out about FB is meant to come out. 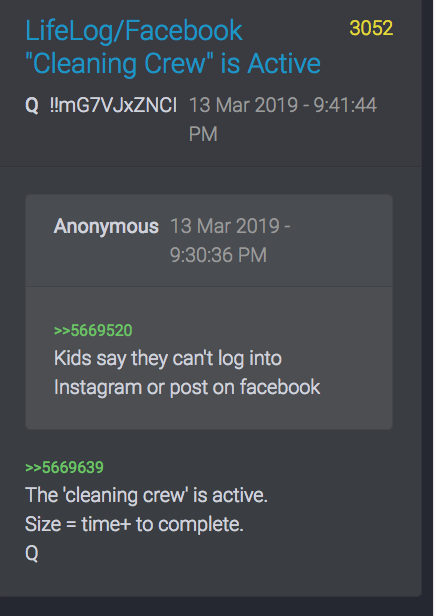 They don't hide these things anymore, as in recent years they are more open about what they are doing and are no longer afraid to hide as much (probably due to their narcissistic side and tendencies). 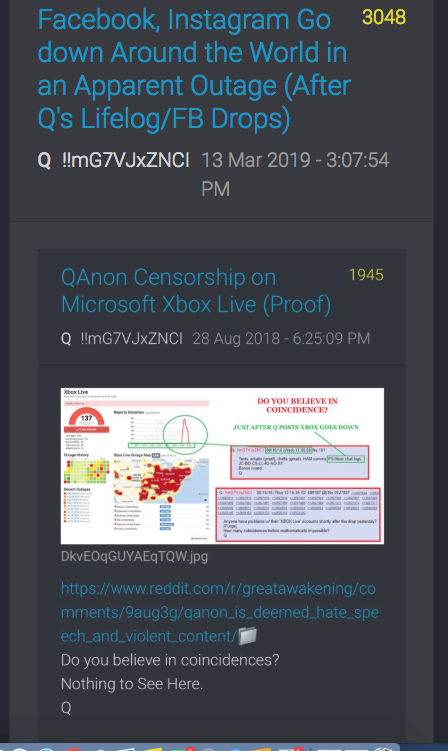 Moreover, they know that they can't hide all these previous OPs anyhow, as there are too many traces for the masses to find now with the internet and in the current level of awakening. Brief, like the Rage Against the Machine song says: Know your enemy. I do agree with you that at this point this is all about spiritual warfare.